This topic shows you how to add a new customer to the list on the Customers page. You can create invoices only for customers appearing in this list. This page lists the names of customers you can invoice. The customers in the list are pulled from family records in your ParishSOFT Family Directory database. You can add a customer only if a Family Directory record exists for the customer. If you want to invoice a customer who is not in ParishSOFT Family Directory, you must first add a family record for the customer in Family Directory. After adding the family record, return to this procedure to add the family to the Customer list. For instructions on adding a family to Family Directory, open the Family Directory application and consult the Help file. To add a customer record, click . This window shows the names of families in your Family Directory database. Find the families you want to add to the Customer list by using the search filters. For example, you can narrow your search by selecting options from the Family Group and Family Workgroup filters at the top of the window. 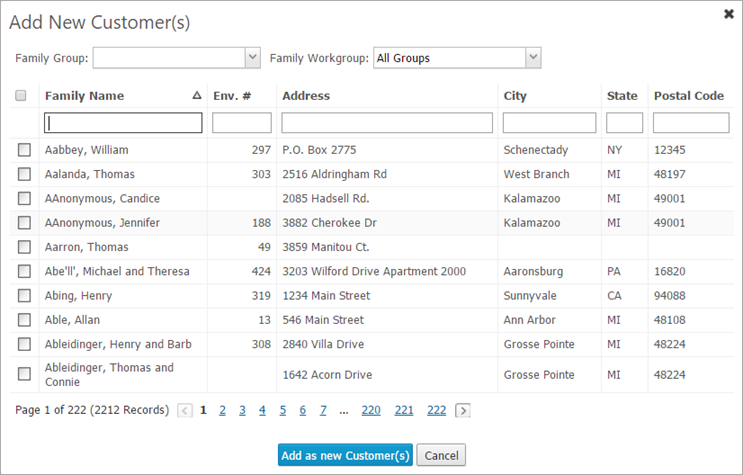 You can also enter specific information into the column filter fields to locate the families you want to add. The list updates to show you the names of families matching your filter selections. Select individual families by selecting the checkbox to the left of each family's name. Select all families in the list by selecting the checkbox in the header (to the left of the Family Name column). If desired, you can conduct another search by using the filters. Then, select those families to add to your list. The selected customers are added to the list on the Customers page. You can now invoice these customers.